Rituals, Habits, and Routines. How history’s greatest thinkers created brilliant work. I just finished reading Daily Rituals: How Artists Work. 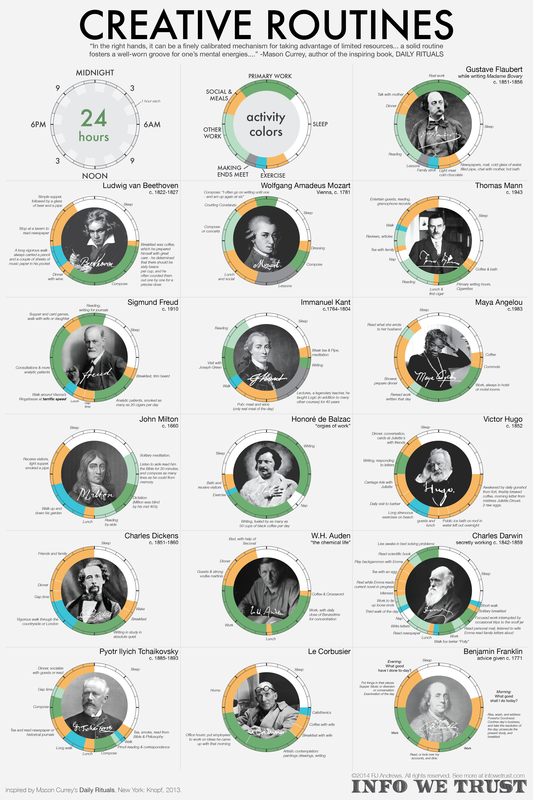 The book goes deep on the daily habits of artists and geniuses as diverse as Pablo Picasso, Georgia O’Keeffe, John Coltrane, Benjamin Franklin, Albert Einstein, Mark Twain, and about 150 others. Rituals, habits and routines. We all have them. What’s fascinating in this book is how you start to draw parallels between these geniuses and how their routines led to great bodies of work. Many of them worked alone, had limited resources, overcame huge obstacles and did not find success until later in life. Sticking to their daily rituals helped keep them on track through difficult times. And when I mention difficult times, I’m including famines, world wars, disease, depressions, political repression, and social injustice. A little different than some of the inconveniences we have today. I like the word habits because it is something you instinctively do. Don’t get me wrong, there are plenty of bad habits out there but if we look at the big picture, hopefully we’re pushing some of these bad habits out of the way by stacking up the good ones. You can stack up your habits the same way you make time for what’s important in your life. I heard a great analogy the other day about oxygen masks. The reason the airline attendant asks you to put yours on first is so that you can help those around you, because if you’re not breathing you’re not much help to anyone. So when I’m looking at stacking habits, I think the best way for me to help in my family and others is to make health, sleep and exercise the core part of my daily routine. It almost sounds easy, but we know it is not. All kinds of crap gets in the way. Sometimes we even feel selfish taking time to exercise or sleep. After years of trying to establish some good habits and get rid of some bad ones, here’s what I found that has worked. Don’t jump right in and try to dump every bad habit while starting up five good ones. Start with something small. Instead of a one hour workout, shoot for 20 minutes of exercise per day, maybe even start with 10 minutes of exercise and grow from there. Sleep is a great habit and one that many people enjoy but don’t make enough time for. I’ve seen this in the startup culture with many following the “you can sleep when you’re dead” mindset. My answer here is play the long game. If you can get in the mindset of living in extra 10 or even 20 years, you’ll naturally start to make sleep, health and exercise a priority. You may be able to sleep when you’re dead but you can’t create anything. I make time to exercise but I also regularly fight fatigue. For me, I found I generally hit a wall around 3 or 4 PM. I call this the dead zone and it generally lasts for about an hour. This is a great time to shake things up a bit, schedule a 30 minute walk. Try to avoid important decision-making or tasks that require high levels of creativity in your dead zone. It’s best to get a change of scenery and some exercise at the same time. Schedule the tough stuff early or when you feel you’re at your peak. Tough stuff can mean different things to different people. My advice is do the tough stuff when you’re at your best. For me that’s about from 7:30 AM to Noon. If you’re in a busy work environment, put things on the calendar. When people grab you in the hall to ask if you could jump on a quick conference call simply tell them “let me check my calendar and get back to you.” People will respect that you organize your time. If it’s at a bad time, let them know, and give them some other options.This way you can usually avoid having your schedule created for you. Even the busiest CEOs know if you don’t choose your schedule, it will be chosen for you. Call it whatever you want, but block that 30 minutes out and stick to it. Once you have two habits you technically have a stack. Remember this is not a to do list. These are daily habits that become part of your routine, Like taking a shower or having dinner. You may only add 1 habit. Everything else may be crazy but that 30 min walk happens. The habit thing was really working for me so I wanted to make room for more. Alas, there are only 24 hours in a day and I need to spend about eight of them sleeping. Something had to go. I chose to go on a high-quality, low information diet eliminating most news, television, and a lot of online distractions. I also avoid any type of shopping whenever possible which has established my frugal habits. This is where your stack of habits become something much bigger. Not to get all Zen on you, but this is where your habits become more of a ritual. You have put in place a daily practice that has essentially become your life, your family, your life’s work, your passions, beliefs and your health all expressed in the way you spend your day. A lot of people never get there, including a few of the writers, musicians, and artists profiled in the book. Some died young without fulfilling their full potential, even ending their lives early by letting some of the bad habits get the best of them and push everything else out of the way. Whatever the reason, the majority of them written about in books like Daily Rituals is that they did get there. The rituals habits and routines enabled them to overcome incredible obstacles and leave behind a body of work that will not be forgotten. Some great books about habits.